What is a reverse cervical curve? Healthy neck curve from real patient at Life In Alignment. With very few exceptions, most people should have a natural, gentle curve forward in their neck. Some necks will be naturally more curvy than others. The natural, normal curve is called lordosis, or to be specific, cervical lordosis. Cervical means neck. A straight neck is called a kyphosis. It can also be called military neck. And in some people this straight neck will begin to collapse forward, causing the neck bones to literally move backward – in the opposite direction of a normal neck curve. Personally, I believe this is a result of multiple traumas, often called whiplash injuries. Don’t be confused by the term whiplash, because these injuries don’t necessarily have to take place in a car. Some of the reverse curves I have seen have been in hockey players. A reverse cervical curve is often associated with symptoms like head pain, neck pain, shoulder pain, and spine pain. Patients can also experience arm and hand pain, or symptoms similar to thoracic outlet syndrome. People with reverse neck curves are also prime candidate for headaches. Headaches of all kinds and varieties are common in patients with a reverse cervical curve. Start of minor reverse in lower neck. This patient showed unlocking after one correction. 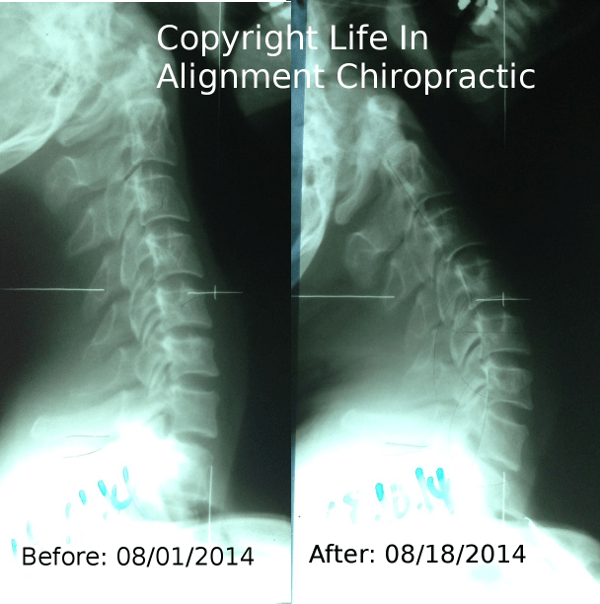 She experienced low back pain and knee pain which ceased with the neck correction. Especially tension type headaches and headaches just under the bone at the back of the skull. While medicine understands that a lot of head, neck, spine, and arm pain is directly related to joint alignment in the neck – most doctors don’t screen for these kinds of neck problems. In other words, as long as your neck is not broken or dislocated then a reverse curve may go a long time without being treated or even discovered. Your neck may start to get attention if an intervertebral disc (disc for short) starts to get inflamed and painful. Discs can get swollen and even herniate, causing pain in the disc itself, or by causing inflammation or direct pressure on a nerve near the disc. Many patients with reverse cervical curves don’t find out that their neck alignment is a problem until it’s bad enough to get an MRI. At that point, the swollen disc gets all the attention, and the curve of the neck does not. It’s common for people to say “Well, I have that too” when discussing your loss of a neck curve. Because a lot of people have this problem, some people think the problem is therefore not a problem. It’s a bit of fuzzy logic. With the amount of physical trauma from car accidents many of us endure, as well as the forward head posture we face from sitting down all day – a lot of people have a loss of neck curve. And fewer have a reverse cervical curve. But just because your neighbor has a loss of neck curve doesn’t mean that yours is not causing an issue. 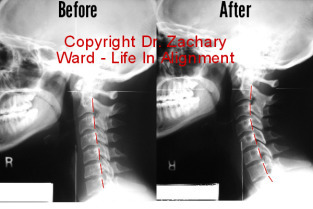 What happens when the neck moves away from normal alignment? In some cases ligaments inside the neck can actually tug on the spinal cord creating a downward pull from the inside the neck – a situation that can create all kinds of strange and confusing symptoms we generally associate with a trip to the neurologist or ENT. Even if there is no stretch to the cord, there can be stretch to the spinal nerves the leave the cord – which can create numbness, tingling, and pain in the upper arms, forearms, hands, or fingers. Does a reverse curve make you more vulnerable to injury? I’m not aware of a study that looks at the health of the neck before a major injury to see if the patient’s neck alignment contributed to their injury. That means I cannot prove what I’m about to say – but I believe there’s some logic behind it. I personally believe that patients with a reverse cervical curve are more likely to experience greater side effects of neck injury or even disability when they experience a bodily trauma. For lack of a better term – all the “available slack” has been taken out of their healthy alignment – to create an unhealthy alignment which has already stressed the bones, joints, ligaments, and muscles to their max, before the trauma. Just as someone with a depressed immune system is more likely to experience the complications of being sick – someone with a reverse neck curve is more vulnerable to further physical injury. All things being equal, I would place my bets on more long term symptoms after a car accident for someone with a reverse curve than for someone with a normal curve. Can you fix a reverse cervical curve? Yes, it’s possible a reverse cervical curve can move to a more healthy alignment. But it depends on the skills of the chiropractor and the health of the patient. And the correction is not guaranteed. Your age, health, and levels of injury and joint breakdown all can all play a role. And so can your lifestyle. If you’re hunched over a smart phone 10 hours per day, all the best care in the world isn’t going to be helpful in correcting your curve long term. Older patients with larger joint degeneration may not see much change in their reverse curve at all. On the other hand, younger patients with very little joint breakdown may experience a rapid change. Keep in mind that correcting a reverse curve probably won’t mean a picture-perfect cervical lordosis. Instead it will probably look something like a straight neck. But that’s still better than the stress of a reverse curve. 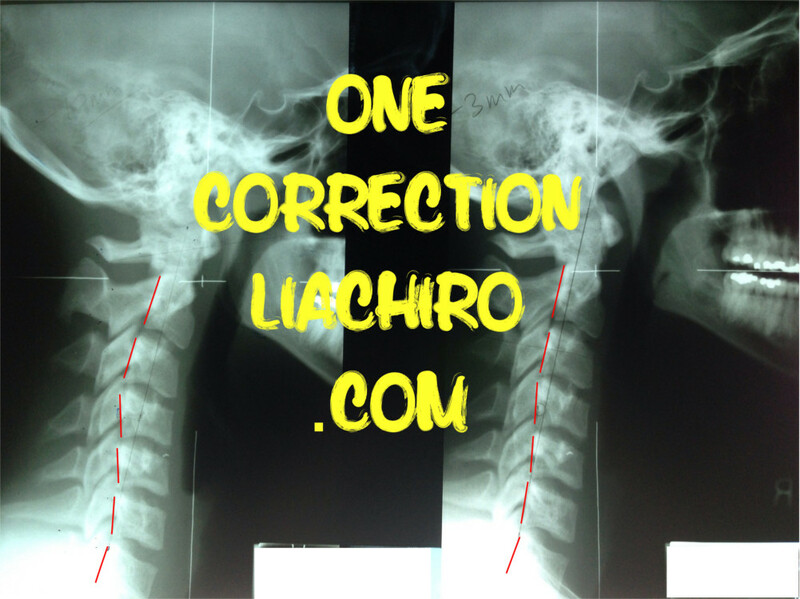 What kind of spinal care care can fix a reverse cervical curve? 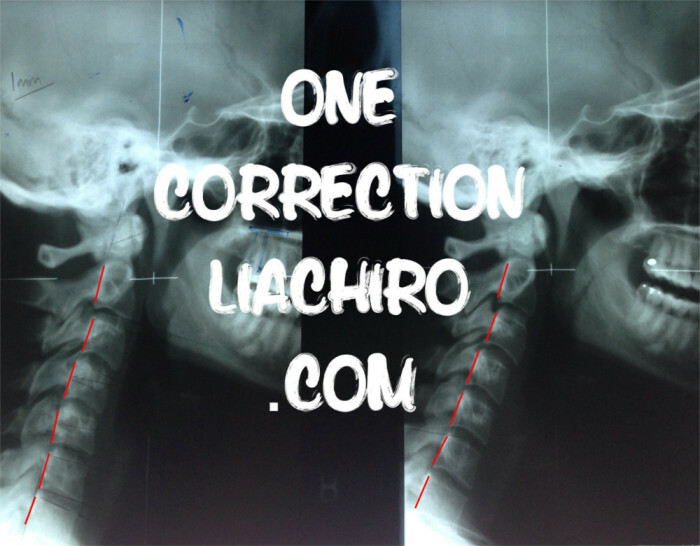 Reverse S-shape configuration with reverse in upper cervical spine, almost completely corrects after 11 months without traction, stretching, or exercises. 14mm change in position of C4! Most chiropractors would probably agree that a series of chiropractic adjustments in the neck with some light neck traction would be helpful in unlocking a reverse cervical curve. While most chiropractors are very good at moving the neck and unlocking joints, I believe the reverse curve requires a few key ingredients that many practices don’t provide. Keep in mind what you’re about to read is my opinion only. 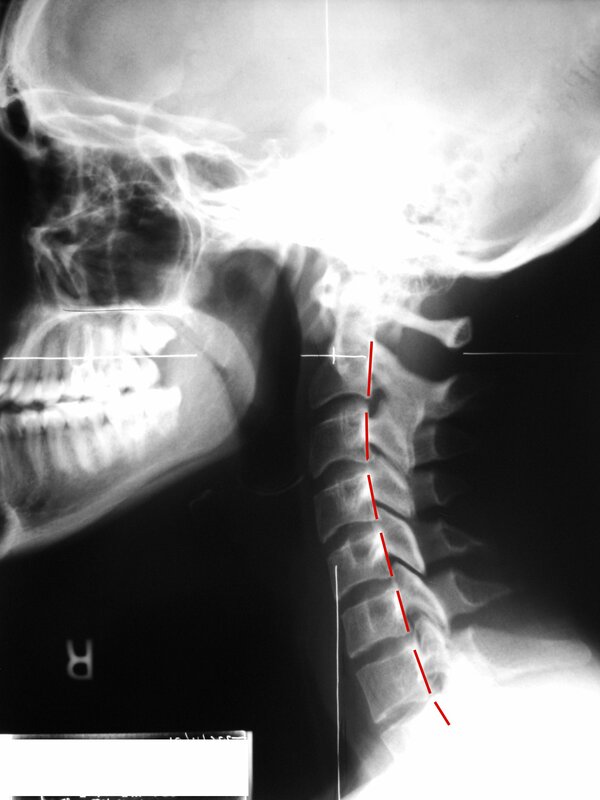 X-rays of the neck taken from the side in a neutral posture. Plus, perhaps flexion-extension views of the neck to see which segments are locked in the mid-and lower neck. A gentle but dynamic method to adjust the mid and lower neck if the neck is not unlocking or regaining normal range of motion from the upper neck correction. However, some patients will not see a change in their curve until the top of the thoracic spine and the mid-neck is corrected as well. Which patient are you? Nobody knows until we try. Some chiropractors promote aggressive use of traction devices, including weights and equipment that puts the neck into a form of extension compression. I don’t personally advocate this approach in my practice. From a mechanical view of your spine, a reverse cervical curve is challenging condition which can create a number of painful and debilitating symptoms. Most patients with a reverse cervical curve don’t often know that this problem neck alignment is contributing to their symptoms or is even the cause of them. Even if they discover that they have a reverse curve, many patients are not informed that a reverse curve may be able to unlock and be partially corrected with quality spinal care. Metro-Detroit readers can request a review of their own neck x-rays or MRI via the contact form.